One of my favorite things as a Atlanta wedding photographer is I get to see so many wonderful weddings. The one thing that I love is when I get to see some one's personality shine through in their wedding. This weeks wedding was great for that. The wedding had so many hand made details that I could not capture them all. Luckily one of the bridesmaids walked me through all the hand made details that were used to make this such a unique wedding. This bride was a fan of Harry Potter and superheros. She hand decorated each one of her brides maids shoes and she even decorated her own shoes in different superhero themes. They were colorful and fun! 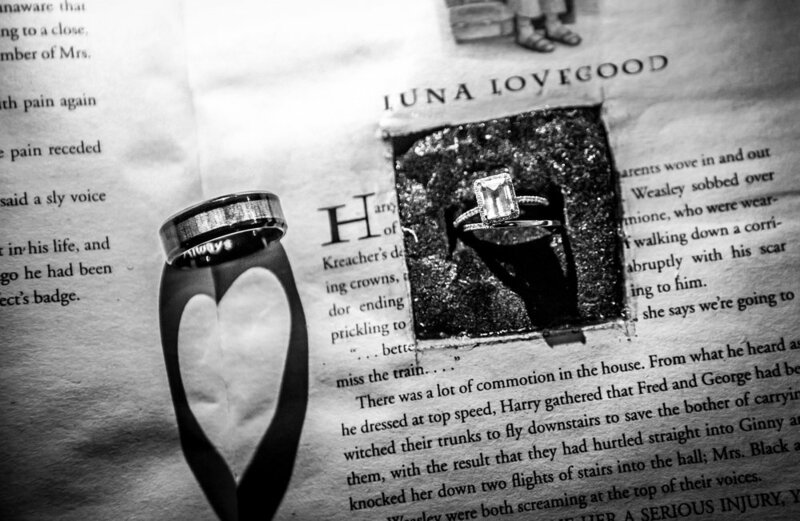 If you have a bride like this she is not just going to put her wedding ring in a box she is going to put in a Harry Potter novel cut out to the page with Luna Lovejoy on it. It was great to see a bride with such a wonderful sense of humor and express herself in the little details that make up her big day! Thank you so much for visiting! I hope you keep coming back to this Atlanta wedding photographer's blog. I would love to hear from you! Please go to the contact section of the website and drop me a line!